A New Moon is a conjunction of the Sun and the Moon. The Sun is in its home sign Leo, in the proud and creative fire sign of the zodiac. The Leo New Moon took place in conjunction with two asteroids from two different regions, a main belt asteroid Vesta and a classical Kuiper belt object Sila-Nunam. Vesta is the brightest visible asteroid, discovered in 1807. It can be seen with the naked eye. The orbital period of Vesta is 3.63 years. There is a huge crater on the surface of Vesta as a result of a collision, which occurred at some point of its history, and which also brought debris from Vesta to Earth. 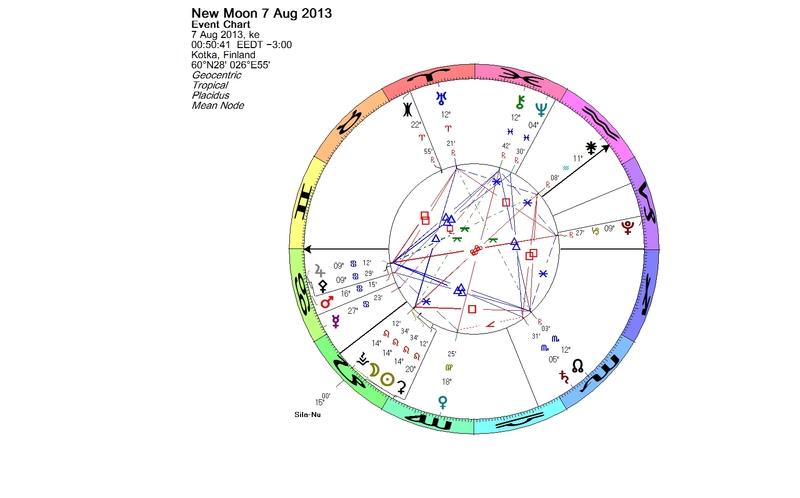 Vesta in Leo in conjunction with the New Moon emphasizes the focus on the self now. In the Roman mythology Vesta was the goddess of home and hearth, the keeper of eternal flame. Vesta represents devotion and commitment. 79360 Sila-Nunam is a transneptunian object, which was discovered 190 years after Vesta, in 1997. It was named in 2012 after two Inuit deities, Sila and Nunam. In fact, the object is a binary, consisting of two almost equal sized bodies. In a binary system the two objects are orbiting each other around a point in the free space between them. The point is called a barycenter, and it is a point where the bodies balance each other. Sila-Nunam’s orbital period around the Sun is little over 291 years. When Sila-Nunam was discovered, the binary was in Cancer. 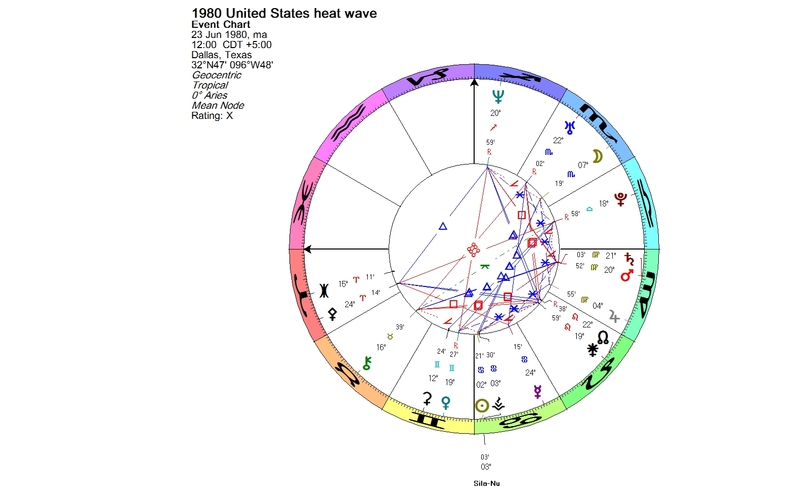 The Sun was in Aquarius, strictly opposite the current New Moon’s degree. Vesta was occupying the same degree with the Sun, as it was at the Leo New Moon. Classical transneptunian objects (cubewanos) are given mythological names associated with creation. Sila, the arctic god of the sky, weather, and life force, represents spirit. Nunam is the Earth goddess, Sila’s wife. Nunam created the land animals (the sea animals were created by Sedna) and the Inuit people. Sila breathed life into the Inuit. Sila is one of the oldest Inuit deities. In Eskimo language, the word Sila has meanings of universe, outer world, and space. The dominant religious system of the Inuit today is Christianity, but many Inuit still hold to at least to some extent of their traditional religious beliefs. The astronomical facts of Sila-Nunam conform the tradition. The members of the so-called cold classical population of transneptunian objects are thought to have formed very far from the Sun, in the outermost part of the protoplanetary disk. Having formed and remained so far from the Sun, they are thought to preserve solids from that environment in a relatively unaltered state. Nunam’s affiliation with land animals is reflecting in the news that came from Costa Rica just prior to the current New Moon. Costa Rica plans to close its two public zoos and free the animals to protect wild life. One of the zoos will be transformed into a botanical garden and the other one into a park. Sila was the god of the sky and weather. In April 2012, at the time when Sila-Nunam stationed direct (April 24, 2012), there were exceptional weather phenomena in the USA and in Britain. The spring storm brought wind, rain and snow to the east coast of the USA. Major League baseball games had to be cancelled, and the space shuttle Enterprise’s landing was delayed. In Britain it was raining and flooding. It was the coldest April in Britain since 1989. The New Moon on May 06, 2012 was squaring Sila-Nunam. The Finnish Lapland received exceptionally heavy snow, and there were rough thunder storms in the USA. In the more distant past, the 1980 United States heat wave started at about the same time (June 23, 1980) when the Sun, Vesta and Sila-Nunam formed a triple-conjunction. The devastating period of heat and drought lasted throughout the summer of 1980. 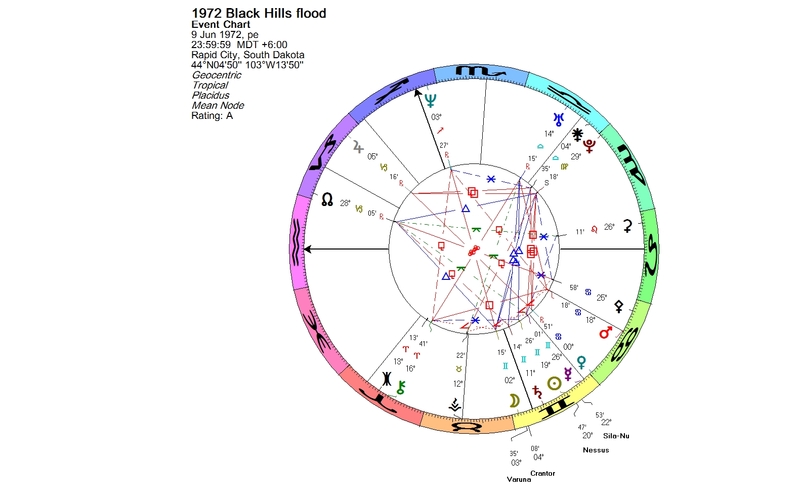 The 1972 Black Hills flood in South Dakota coincides with a conjunction of the Sun, Nessus and Sila-Nunam. The flood was caused by the unusual amount of rain that the area received. The orographic effect helped the air to rise, cool, and release its moisture in repeating thunderstorms. The flood hit Rapid City the hardest around midnight on June 9. The Moon was in triple-conjunction with Varuna (the maker and upholder of heaven and earth) and Crantor (the co-orbital companion of Uranus), and opposing Neptune. 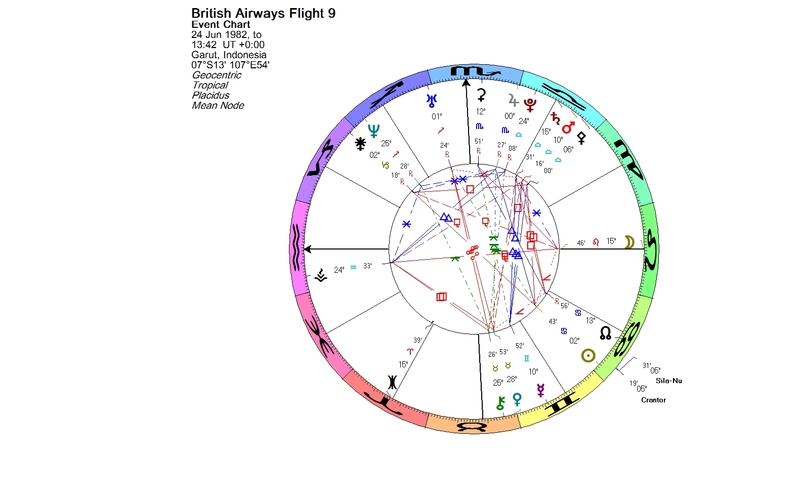 An incident referred as British Airways Flight 9 or the Jakarta incident on June 24, 1982, happened when the Sun was conjunct Crantor and Sila-Nunam. 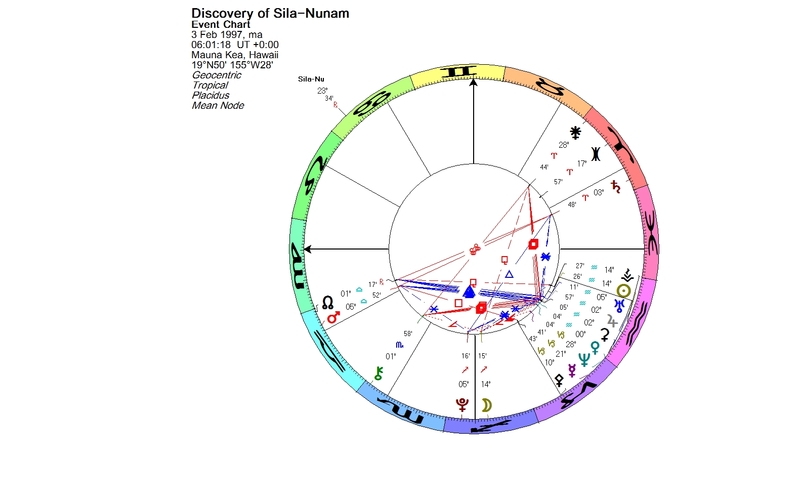 In the chart there was a yod pattern formed by Chiron, Neptune and Pluto. The flight was a scheduled British Airways flight from London to Auckland, during which all four engines of the aircraft failed temporarily. The aircraft flew into a cloud of volcanic ash from the eruption of Mount Galunggung in Indonesia. The reason for the failure was not immediately apparent to the crew. The first engine flamed out at 13:42 UT and three others soon followed. Luckily the plane was able to glide far enough to exit the ash cloud, restart the engines, and land safely in Jakarta. As examples of individuals born with Sila-Nunam in conjunction with their Sun, showing Sila-Nunam’s creative power, can be mentioned actress Shirley MacLaine, actor-director Ethan Hawke, country music singer Blake Shelton, the Finnish TV-personality Arman Alizad, acrobatic gymnast Kristin Allen, artistic gymnast Rebecca Bross, and the Swiss ski jumper Simon Ammann. With this Leo New Moon, we can let Sila breathe life into our creative fire and keep the flame alive. You are currently browsing the Lunations by Kirsti Melto weblog archives for August, 2013.